This year, while celebrating the?Irreecha?festival, Oromo communities in the Diaspora will commemorate those who were murdered in Bishoftu on October 2, 2016 by the Ethiopian government forces and the conditions they created to victimize innocent people. Irreecha is an ancient Oromo cultural tradition which survived many years of repression, and continues to flourish. It is observed in late September and early October annually at the historic Lake (Hora) Arsadi near the town of Bishoftu, about 25 miles south of Finfinee (Addis Ababa). In recent years three to five million people attended the annual festival. 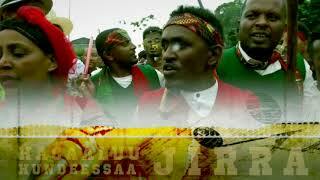 For the Oromo, the day and the ground of the?Irreecha?celebrations are sacred. Participants gather and proceed in peace (nagaa); with greeneries in their hands, they chant praise to their God and pray for good life and prosperity for their families. Unfortunately, the Oromo peace? (nagaa) was disturbed and the sacred irreecha?ground was desecrated by the actions of the Ethiopian government forces on October 2, 2016. In unprecedented cruelty, government forces fired live ammunition on a huge crowd, caused stampede and killed hundreds of festival participants. This?Irreecha?day massacre was the culmination of years of Ethiopian government-sponsored violence. When the Oromo protested the violence in 2014-16, the government unleashed lethal force against peaceful protestors. The killing at the?Irreecha?festival on October 2, 2016 was part the Ethiopian government?s repressive rule. So far, no one has been brought to justice and none of the perpetrators of the violence are apprehended. Instead, thousands of innocent citizens have been detained, tortured, maimed and killed in prison. Many families have been displaced and hundreds have perished by exhaustion from desert heat or when their boats were over-turned at seas as they sought refuge abroad. On October 2, 2017, Oromo communities in the Diaspora gather to protest the 2016?Irreecha-day Massacre and the continued repression, imprisonment, torture, the killing of innocent people. During the commemorations and protest rallies, they also support the ongoing Oromo resistance to defend their civil and human rights against the repressive regime. The Oromos in the Diaspora support the current?Qeerroo-led peaceful protest and strongly condemn the incitement of violence between the Oromo and their neighbors in the east and southern regions of Oromia. With coordination of Oromo community leaders and civic organizations, Oromo Diaspora communities in Africa, Australia, Europe, the Middle East, the United States and Canada will rally on October 2, 2017 in major cities worldwide to educate the global community about the suffering of the Oromo and other peoples in Ethiopian and submit petitions to governments and international organizations.? Before or after the rallies, they will also take time to remember the victims of the 2016?Irreecha-day Massacre. The coordinators of the Irreecha Massacre Commemoration and protest rallies urge Oromos and all peace-loving individuals to participate in this historic event on October 2, 2017.?Irreecha?is a sacred Oromo holiday. We will not allow the desecration of our culture, and we will never forget the victims of?Irreecha-day Massacre. Unity is strength; Oromia shall succeed.